There are few greater ironies in History than the fact that the fate of Eastern Christendom should have been sealed—and half of Europe condemned to some five hundred years of Muslim rule—by men who fought under the banner of the Cross. Those men were transported, inspired, encouraged, and ultimately led by Enrico Dandolo in the name of the Venetian Republic; and, just as Venice derived the major advantage from the tragedy, so she and her magnificent old doge must accept the responsibility for the havoc that they have wrought on the world. Hagia Sofia, in the Sultanahmed District of Istanbul, may be one of the most recognizable buildings in the world. The one-time church, then mosque, and now museum with its immense dome and soaring salmon-colored walls has become the symbol of Istanbul and of Turkey itself. The site where Hagia Sofia now stands, located on a prominent headland overlooking the Bosporus Strait, which flows from the Black Sea into the Sea of Marmara and separates Europe and Asia, was the Acropolis of the ancient city of Byzantion. 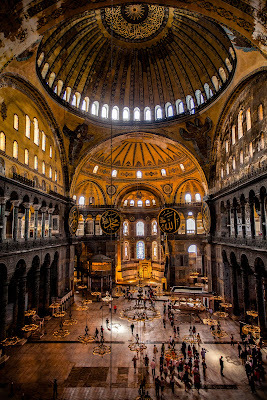 The current Hagia Sofia was the third and last of three churches built at the same location. The first, known as the Great Church, was built by Constantius II (r. 337–361), son of Constantine the Great, who founded a new city on the site of ancient Byzantion in a.d. 324. 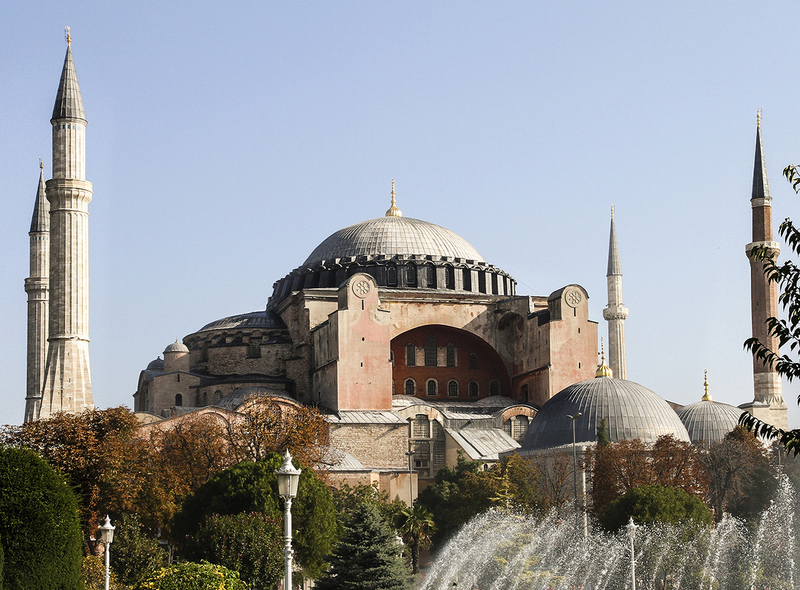 He dedicated the city and on May 11, 330 and renamed it after himself: Constantinople. The Great Church built by Constantius II, later to be called Hagia Sofia (“Holy Wisdom”) was dedicated on February 15, 360.This church was destroyed by fire in 404 during riots triggered by John Chrysostom (c. 349–407), the 37th Patriarch of Constantinople, who in a series of hair-raising sermons from the pulpit of Hagia Sofia fulminated against the unbridled licentiousness of the Byzantine Emperor Arcadius and his court, singling out for particular opprobrium the Emperor’s consort, Eudoxia, whom he compared to the Biblical Jezebel. These sermons got him banished from Constantinople. 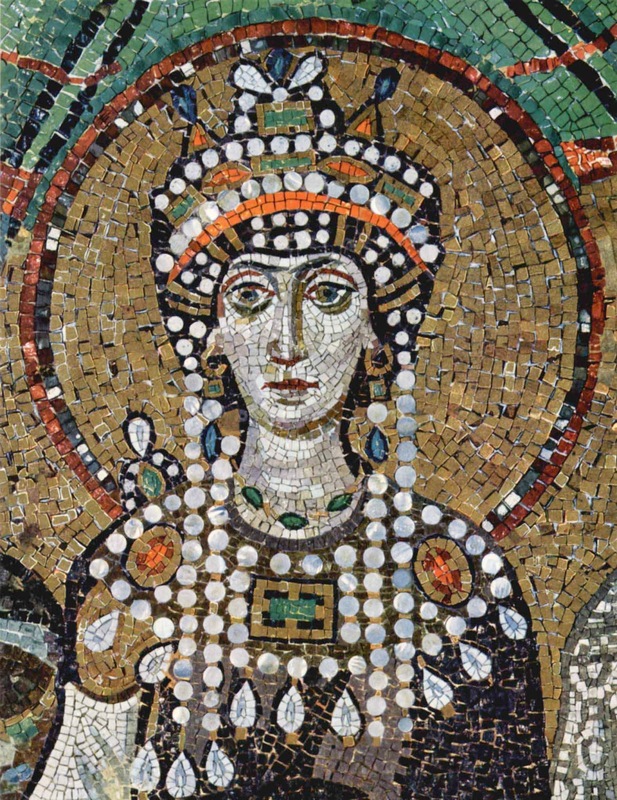 Following mass demonstrations among his followers, who had been driven to a frenzy by his sermons (his name Chrysostomos in Greek, anglicized as Chrysostom, means “golden-mouthed”), he was allowed back into Constantinople, where he again preached from the pulpit of Hagia Sofia, this time comparing Empress Eudoxia to Herodias, the mother of Salome, demanding the head of Saint John the Baptist on a platter. This and other infelicities got him exiled from Constantinople yet again. His infuriated followers protested and in the ensuing riot Hagia Sofia was set aflame and almost completely destroyed. For while it is impossible for a man who has seen the light not also to die, for one who has been an emperor it is unendurable to be a fugitive. May I never be separated from this purple [the color of royalty], and may I not live that day on which those who meet me shall not address me as mistress. Bucked up by these words, Justinian ordered a savage reprisal. Thirty thousand rioters were corralled by forces loyal to the Emperor and slain on the floor of the huge stadium known as the Hippodrome, located not far from Hagia Sofia. 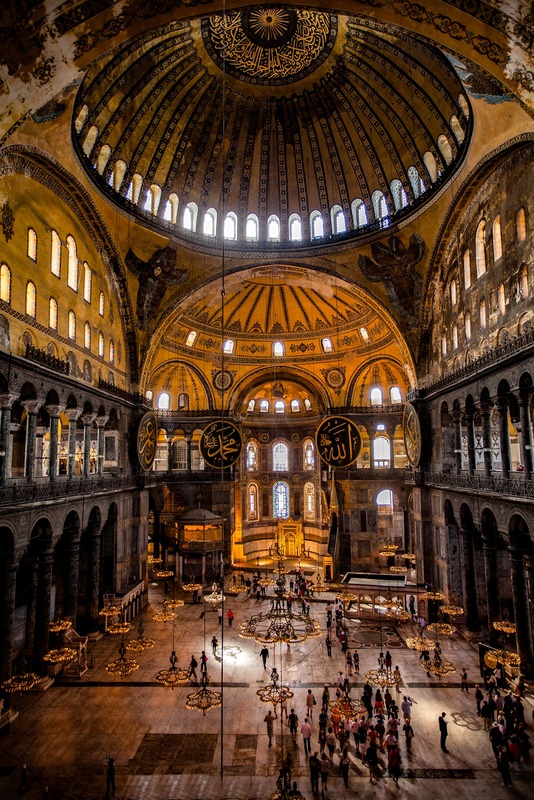 Despite structural flaws that required major revisions and damage from earthquakes (a temblor on May 7, 558 brought down the original dome), fires, riots, and aging, the basic structure of Hagia Sofia remains the same to this day, although of course it no longer serves as a church. It was converted into a mosque by Sultan Mehmed II on May 29, 1453, the day Constantinople fell to the Ottoman Turks and Byzantium, after 1123 years and eighteen days, came to an end. Then in 1935 Mustafa Kemal Atatürk, the founder of the secular state of Turkey, ordered that Hagia Sofia be turned into a museum. Over three million people a year visit the museum of Hagia Sofia, making it Turkey’s biggest single attraction. Every morning hundreds of people line up by the entrance gate for the 9:00 opening, this despite the spate of terrorists attacks that have plagued Istanbul in recent years. 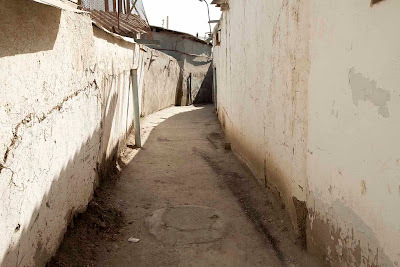 On January 6, 2015, a female suicide bomber killed herself and one policeman in front of the police station just 200 feet from the entrance to the museum. On January 12, 2016, a Syrian member of ISIS blew himself up and killed thirteen tourists in front of the Obelisk of Theodosius, 1,000 feet from the museum entrance. (The obelisk stands on what was once the old floor of the Hippodrome, now Sultanahmet Square, where the Nika rioters were massacred. According to legend their bones are still buried there.) But still crowds stream into Hagia Sofia. Hundreds, sometimes thousands, mill around the main floor of the building, which measures 220 by 250 feet. Some stand in the exact center of the main floor, where an inset disk of dark marble known as the Omphalos marks the spot believed by some to be the Navel of the World. Almost everyone cranes their necks upward to the vast dome, 102 feet in diameter and peaking at 182 feet above the floor. The more curious may take note of the 104 columns in the interior, including eight huge shafts of porphyry taken from quarries in Upper Egypt and believed to have first stood in the Temple of the Sun in Baalbek, in what now Lebanon, the eight columns of green marble from the quarries of Thessaly in Greece, and the many other columns of variegated stone, all transported here to grace Hagia Sofia. Most visitors will trudge up the broad stone steps, the centers of which are worn down inches by centuries of foot traffic, to the galleries overlooking the main floor. 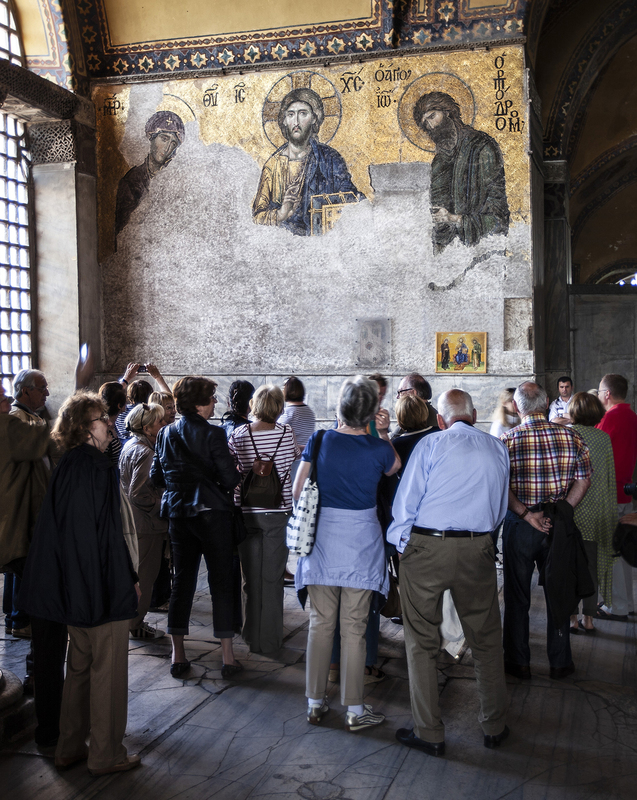 Adorning the walls of the the South Gallery are several magnificent Byzantine-era mosaics that have been painstaking restored after being plastered or painted over when Hagia Sofia was a mosque. 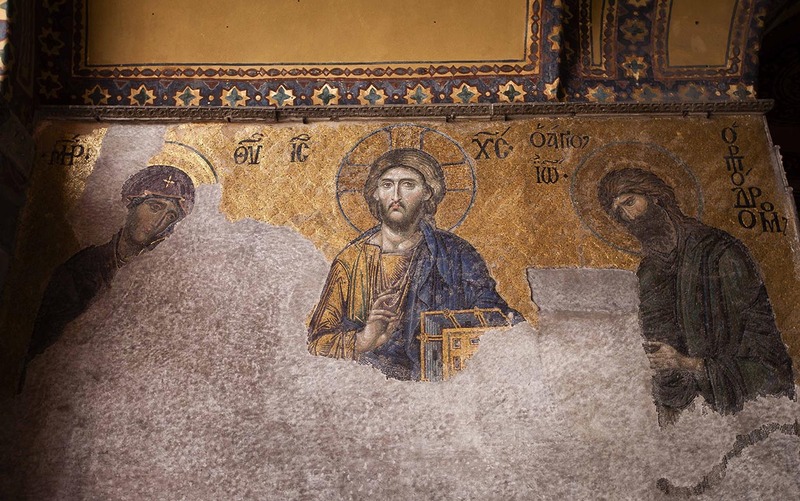 Perhaps the most famous mosaic, The Deesis, is on the side wall the middle bay of the South Gallery. In Byzantine art a Deesis (Greek for “prayer” or “supplication”) is an iconic representation of Christ flanked by John the Baptist and the Virgin Mary. John and Mary are shown turned toward Christ with the their hands raised in supplication, interceding with Christ on behalf of mankind at the time of the Last Judgement. The Deesis in Hagia Sofia, measuring 20 feet wide and 13.5 feet tall, was probably created in the latter part of the thirteen century, although this dating is disputed, making it one of the very last mosaics added to the church and in the opinion of some the very finest. 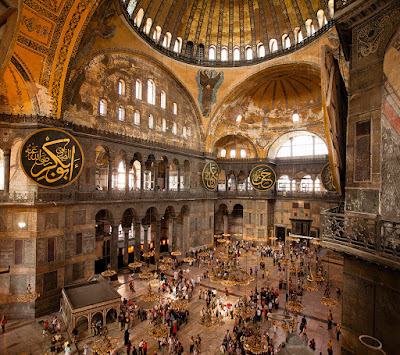 The mosaic had been covered with plaster and paint when Hagia Sofia was a mosque. In 1934 the American historian Thomas Whittemore and a team of craftsmen and restorers from the Byzantine Institute of America began the painstaking work of uncovering and restoring the Dessis. Not until 1938 was the restoration completed. Almost everyone who enters the South Gallery stands for at least a few minutes in front of the Deesis, many snapping photos with cameras, smart phones, and tablets. Most then turn and proceed to other mosaics at the end of the gallery. 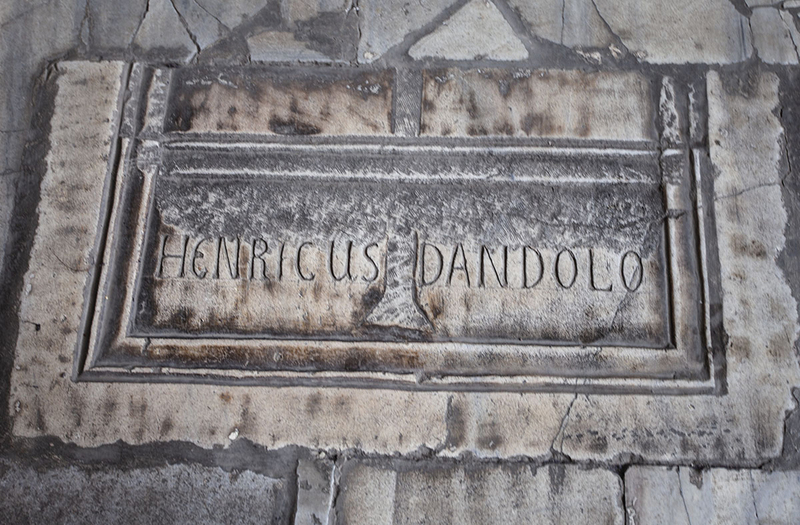 Before leaving the middle bay a few may notice near the wall opposite the Deesis a blue sign bearing the words “Grave of Henricus (Enrico) Dandolo, Doge of Venice and commander of the armies that invaded Constantinople in the Fourth Crusade. 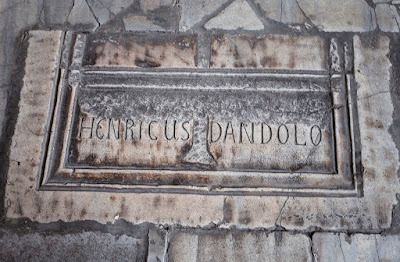 He died during the expedition and was buried in Hagia Sofia.” Of the few who notice the sign even fewer stop to glance at the stone inset in the floor bearing the inscription “Henricus Dandolo”. This, allegedly, is his tombstone. 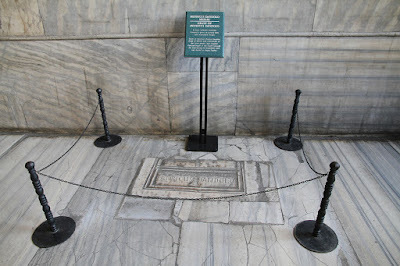 Enrico Dandolo was the only person ever buried within the confines of Hagia Sofia. Most Byzantine emperors, including Constantine the Great, were entombed at the Church of the Holy Apostles, which was demolished in 1462 and replaced by Fatih Mosque (Mosque of the Conqueror). The tomb of the Conqueror of Constantinople, Mehmed II, can still seen there today. Other Ottoman sultans were entombed in courtyards just outside Hagia Sofia and at various other locations around Istanbul, but none were ever buried within Hagia Sofia. Enrico Dandolo alone was accorded this honor. The Latin Empire of Constantinople created by the Frankish Crusaders and Venetians under the leadership of Enrico Dandolo lasted until 1261, when the Byzantines ousted the occupiers and recaptured the city, but their empire would never recover its former greatness. Irreparably weakened, the Byzantines stumbled forward for another 247 years, but were finally defeated by Mehmed the Conqueror in 1453, creating the fault lines between Islam and the Occidental Christian world that exist to this day. On November 27, 2004, in what was hoped would be a further gesture of good will, Pope John Paul II presented two sets of relics to Patriarch Bartholomew while the later was on a visit to Rome. One group of relics contained the bones of Saint John Chrysostom, who as we have seen instigated the riots which resulted in the burning of the second Hagia Sofia. The second group included the bones of Saint Gregory Nazianzus (c.329–390), a priest from southwest Cappadocia in Turkey who eventually become the 35th Archbishop of Constantinople. These relics, which had placed in new crystal reliquaries, were to be transported to Istanbul and on November 30, feast-day of St. Andrew, patron saint of the city, installed in the Patriarchate headquarters the Fener district. This apparent chastisement did not sit well with some in the Pope’s camp. A Vatican spokesman first cast doubt on whether the relics of Saint Gregory of Nazianzus had ever been in Constantinople in the first place. Instead, he claimed, the relics had been translated (the technical term for moving relics from one place to another) to Rome for safe-keeping in the eighth century by Greeks nuns. Other accounts, however, insist that in 950 his relics were moved from his birthplace at Nazianzus to Constantinople and were subsequently seized by the Crusaders and taken to Rome. As for the relics of Saint John Chrysostom, the spokesman would only allow that they had been translated to Rome “at the time of the Latin empire of Constantinople.” He also insisted that the relics had not been stolen, since according to well-established Catholic belief relics could not be translated unless the relics themselves, which were believed to possess spiritual power, allowed it to happen. Ultimately, it was God’s Will that the relics had ended up in Rome. Thus while the Pope was apologizing for the sack of Constantinople in 1204 he was not apologizing for the translation of the relics to Rome. The return of the relics was a good-will gesture only and not an admittance of any wrong doing. This point being made, the relics of Saint John Chrysostom and Saint Gregory of Nazianzus were, as planned, handed over to Patriarch Benjamin on November 27, 2004, and they now reside, apparently of their own volition, at the Patriarchial Cathedral of St. George in the Fener district of Istanbul. Thus have the events of 1204 reverberated down to the twentieth-first century. Although the relics of Saint John Chrysostom and Saint Gregory of Nazianzus ended up in Rome, innumerable other relics were translated to Venice—stolen, in less technical terms—by the Enrico Dandolo-led Venetians. Relics were, of course, just part of the Vast Array Of Loot seized during the sack of Constantinople and transported back to Venice, much of which is still on display in the city to this day. But relics may have had a special importance to Enrico Dandolo, since his family had long been involved in the “translation” of religious artifacts to Venice, and indeed the rise to prominence of the Dandolo Family was due at least in part to the honor bestowed upon it by what in the eyes of their fellow Venetians were these acts of religious piety. Thus when Enrico Dandolo translated relics to Venice he was just continuing a tradition initiated long before by his illustrious family.